The Chinese Wall Art is rich in its innovation and originality. There are some typical designs that find their original back to China, and some of these are quite old. 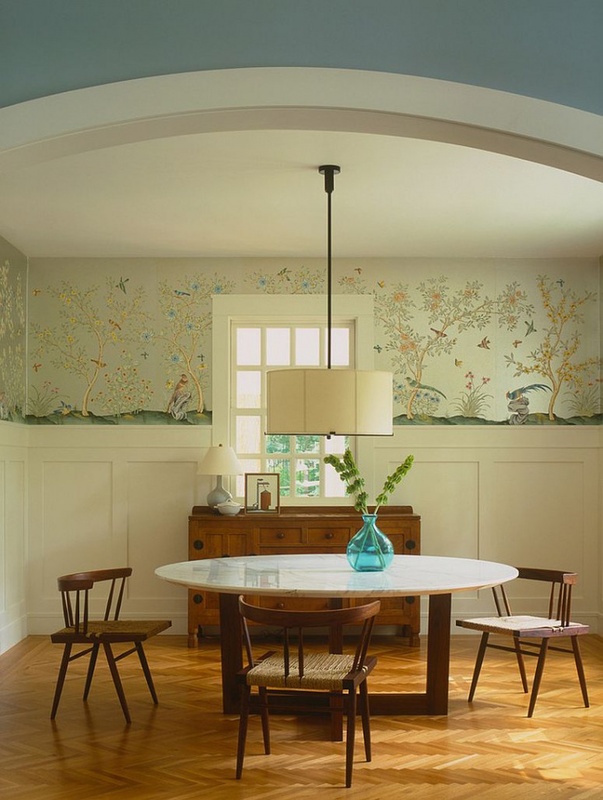 Well, modern houses of other cultures look great when the Chinese wall stickers and other art ideas from China are incorporated in them. There is a striking variation in the colours and themes, especially with the ancient Chinese murals and dragon art. Here are ten Chinese wall art concepts for you. 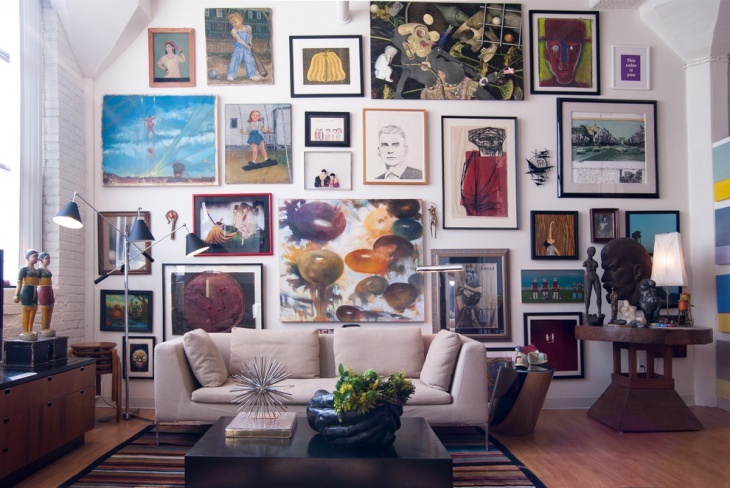 Houses with living rooms that have a lot of sofas and furniture need a conspicuous wall art to make the room beautiful. This wall art from China has a lot of colour variations in it. It looks vibrant when it is set in a cream colored wall. Along with the metal coffee tables and grey-based cushion covers, they look beautiful. Wall paintings are rich in elegance. 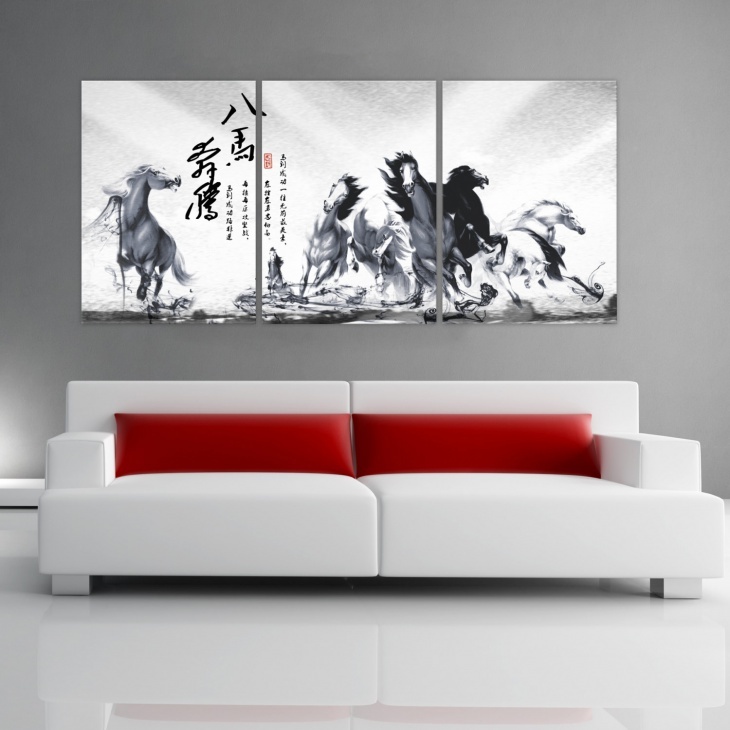 In the sitting rooms with a grey theme, a typical Chinese wall painting consisting of eight horses look classy. It goes well with the grey walls and sofas. The floors are also made grey to match the look of the home. Red cushions create a contrast on the two adjacent sofas. In case you are fond of retro wall art, you can try out the Chinese theme. There are several old portraits displayed on the wall. These include people, scenery and abstract paintings. It is compatible in looks to the light wooden floor of the room and contemporary floor lamps in the room. 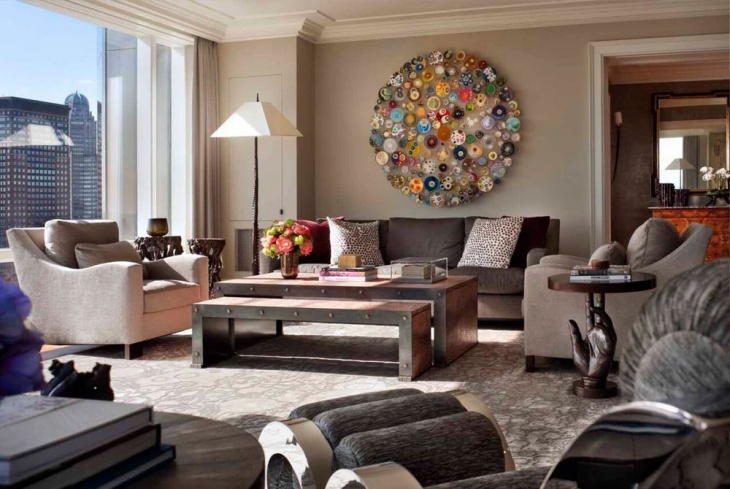 Contemporary sitting rooms look beautiful when the ancient Chinese wall mural themes are incorporated in them. The old portraits are placed on a wall with a black backdrop. This is in good combination with the black window grills. The polished light wood floor and four- legged coffee tables look gorgeous. 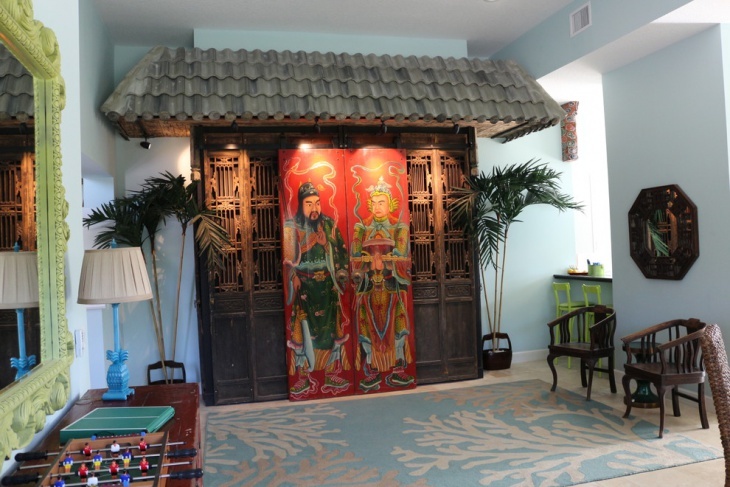 Rooms with little furniture that have a sitting arrangement on the floor with blue-based carpets look rich, when the traditional Chinese wall hangings are used. These include themes based on ancient characters and human figures. 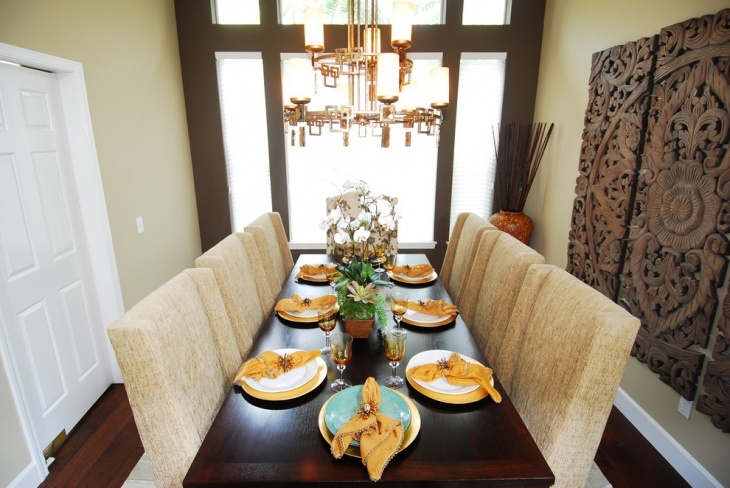 The white walls and dark brown furniture go well with this setting. Dragons have been the trademark of the Chinese arts. The dragon-based themes look rich in heritage when they are incorporated in the blue-based walls. 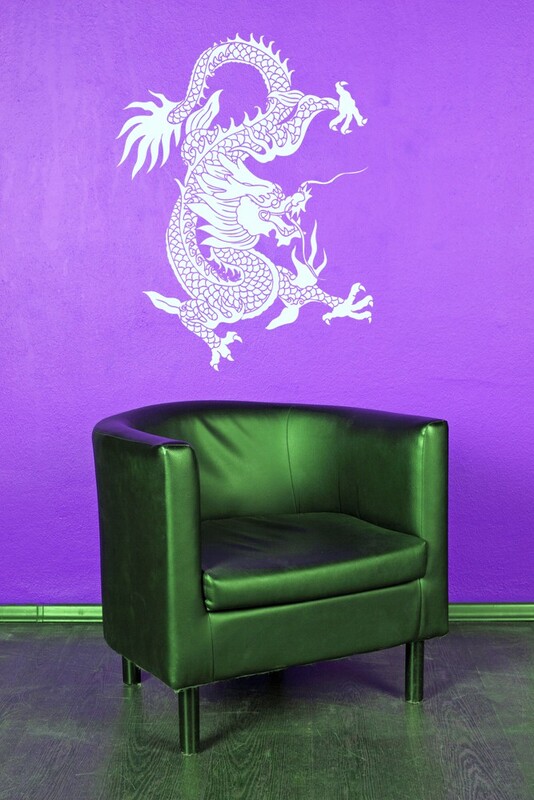 Place a polished green sofa just below the white dragon art. A green-polished floor will make it look beautiful. The Chinese alphabets are peculiar and can be used as innovative wall arts. 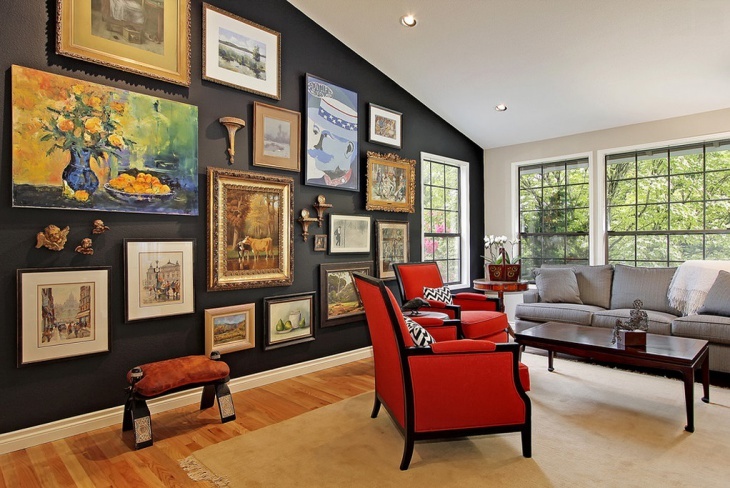 A sitting room with wooden floor and light-colored sofa looks good when red paints are used to draw the calligraphy on the walls. The cream colour of the sofa matches the colour of the walls. 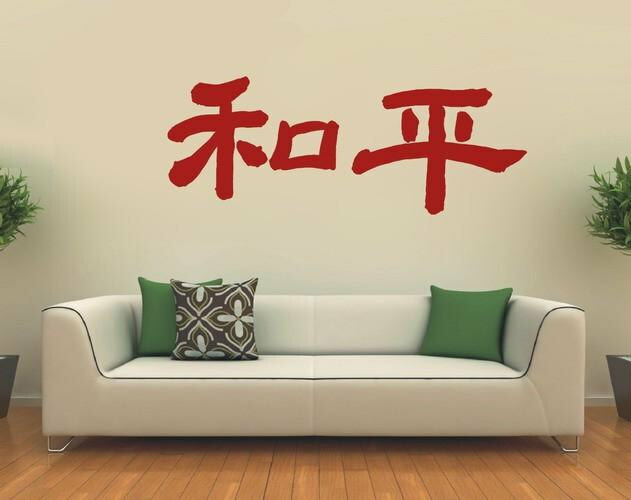 The Chinese Character Wall Art is ideal for a dining room. 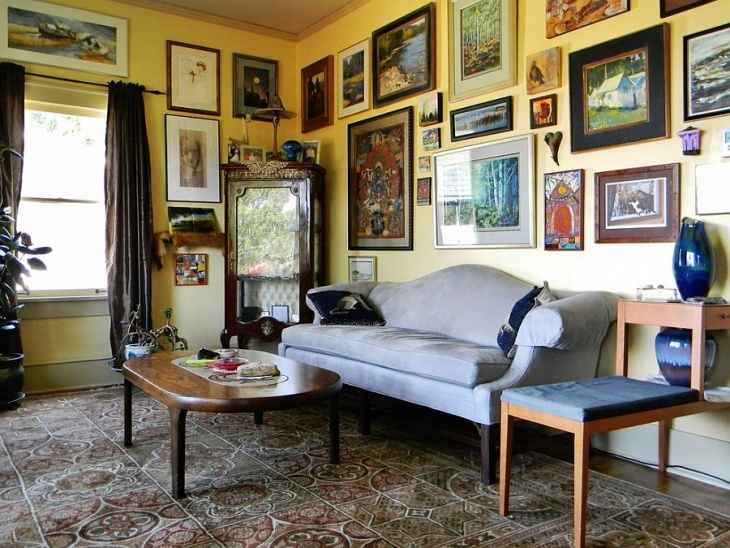 The brown-yellow furniture goes well with the golden background of the artwork. Human characters based on natural scenery from the main theme of the art. White ceiling and floor are ideal for this room. 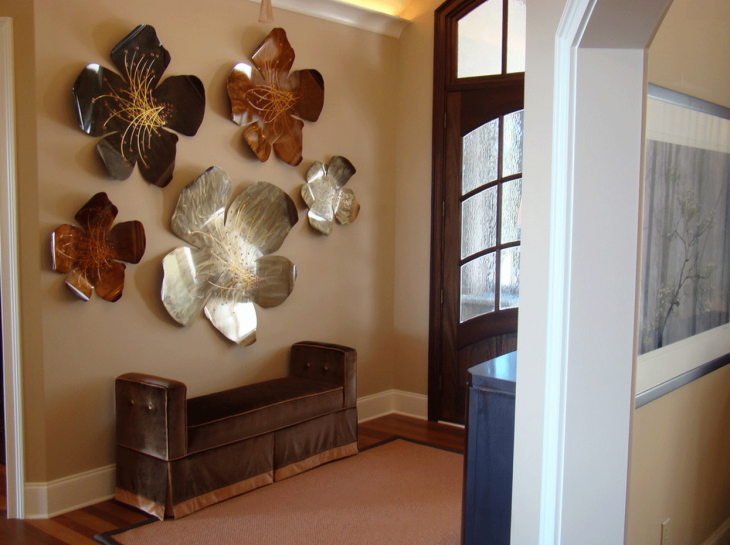 Living rooms that provide a good view of the gardens can be themed with the modern Chinese framed art. The traditional rolled arm sofas and white armchairs are typically Chinese in origin. The rounded white window goes well with the light coloured walls. 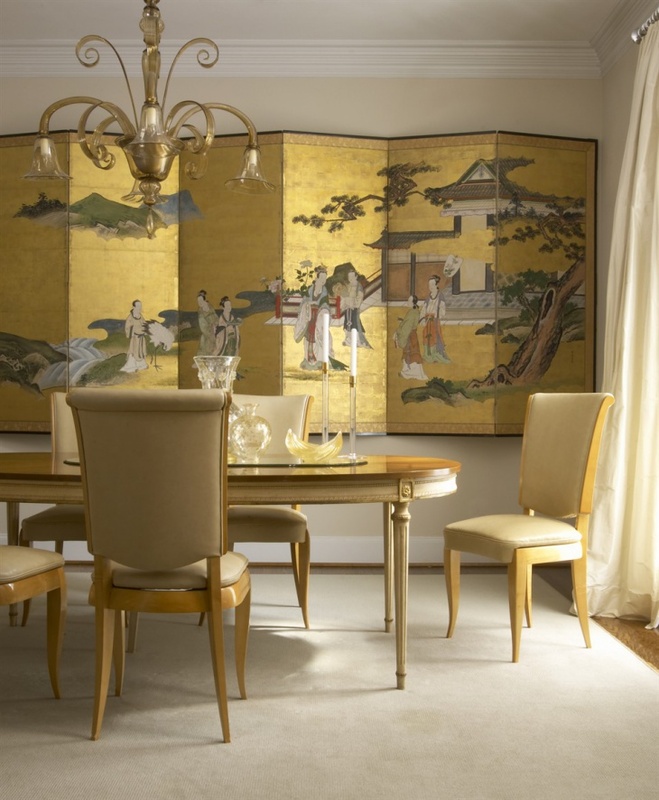 In many contemporary homes, where there is a common living and a dining room, the Chinese symbol wall art is the most attractive way to create a luxurious setting. 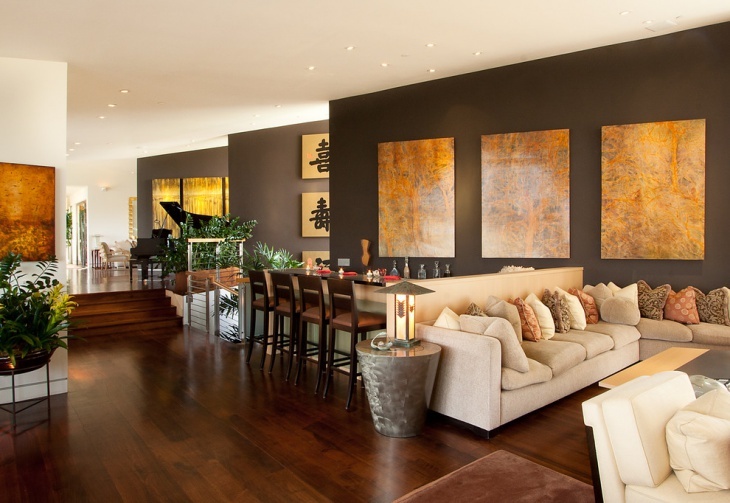 The dark, polished wooden floors go well with the black walls with glowing golden abstract designs, square in shape. Thus, you will find the Chinese Wall Art to be immensely diversified. The ancient themes from the country rich in heritage make a good setting for the contemporary rooms. With the right incorporation of other accessories, furniture, wall colors and floorings, wonderful themes can be made in the modern homes. If you have already made some of these innovative themes, you can share them with us and let us know.